Please reference as: Liz Stanley (2018) ‘Working with Dorothy Smith: texts in action’ Whites Writing Whiteness www.whiteswritingwhiteness.ed.ac.uk/overviews/working-with-smith and provide the paragraph number as appropriate when quoting. 1. The Whites Writing Whiteness project works with a very large body of evidence that dates from the 1770s to the 1970s – many thousands of letters plus official documents, Wills, copies, notes… The questions it uses this data to explore include how South Africa’s racial order came into being, what kinds of ideas and descriptions of people were part of it, how these things changed and became more dominant, negative and controlling over time, and were then challenged and in time overturned. 2. In using letters to explore ‘whites writing whiteness’, some important practical questions arise, concerning how these writings should be worked with, including whether this is with individual letters, flows of letters between particular people, or white letter-writing overall over the 200 year period of concern. Should the content of letters be focused on? What about their structure regarding the conventions concerning how to write and what can and cannot be overtly expressed? Should the context and the particular circumstances which gave rise to a letter be taken into account? And what about the effects and how letters are responded to, in writing replies and in the lives of the people concerned more generally? 3. The work of Dorothy Smith, a feminist sociologist who is deeply concerned with the analysis of texts of different kinds as part of her wider intellectual project, is helpful in thinking through how to do this. Smith is best known for her work as a social theorist and as the originator of the influential methodological platform known as Institutional Ethnography. As an aspect of both, she is concerned with how ideas translate into working practices, with her work developing theoretical interpretations through detailed substantive analysis. An important aspect of this is that theory is not treated as something to be ‘applied’ but instead used, used in a way that is responsive to the particularities of context as well as content. 4. Among other concerns, Smith’s work is focused on texts as an important component of institutional ruling relations, by which is meant the kind of written and other texts produced by organisations of different kinds and which serve to direct the conduct of the people – such as customers, clients, workers – who have dealings with them. Her approach recognises the performative character of written texts, in particular regarding how they are taken up and ‘actualised’, that is, how they are used and responded to by people. 5. Smith’s approach to the analysis of texts has been an influence on how letters and other documents of life have been analysed and interpreted within the framework of WWW research. Her rejection of any easy distinction between theory, methodology and method and instead harnessing them all in providing detailed substantive analyses has been a particular inspiration, together with her ideas about seeing texts as ‘texts in action’ and with particular emphasis on the temporalities involved and the ‘act-text-act’ sequence. These are at the heart of letter-writing and letter-exchanges, bringing Smith’s concerns and those of the WWW project close together. Discussions of analytical examples are of course always concerned with specific contexts and activities, although the analytical procedures she uses in doing so involve Smith assembling and using practical and transferable skills and techniques that can be used to analyse different examples as well as her own. 6. 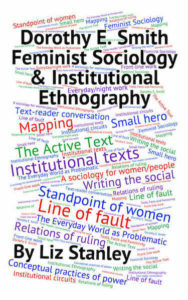 A detailed discussion of Smith’s work including her ideas about texts and a range of her detailed analyses of them is provided in: Liz Stanley (2018) Dorothy Smith, Feminist Sociology & Institutional Ethnography. Edinburgh: XPress.